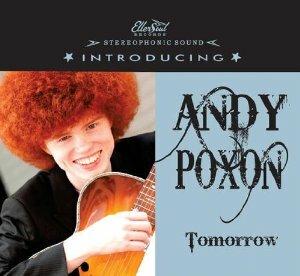 I’ll get this out of the way: Andy Poxon, at 18 years old, is a recording veteran. His first CD, Red Roots, was released three years ago. Now, I don’t rate age any more than I pay attention to looks when I listen to music. I like to consider talent on its own merits, and youth seems most often to be used as a marketing gimmick, like girls with guitars. Neither in itself is any sort of big deal, nor–like Poxon’s distinctive, blazing red Afro–has it any relevance to the music. But this Washington, D.C.-based singer-songwriter-guitarist, whose new album Tomorrow has just been released by EllerSoul Records, is unmistakably developing into an artist to watch. 2009’s Red Roots, recorded with his working band (bass and drums), was sung well enough and played with some flair. But in essence it was a rather workmanlike album informed by classic rock moves, splashed with some pleasant R&B flavor and a few straight-up blues numbers, some of them quite derivative. The new album is something else entirely. Tomorrow is a quantum leap forward. In collaborating with producer Duke Robillard (who, along his band, also performs), Poxon seems invigorated. Excellent arrangements and a seasoned supporting cast are some keys to Tomorrow’s success. One of the secret weapons in play is the Roomful of Blues horn section: Doug Woolverton (trumpet), Mark Earley (tenor and bari sax), and Rich Lataille (tenor and alto sax). Their fills are always right on, and the (uncredited) charts are memorable and infectious, bringing the tracks vividly to life. Bruce Bears makes important contributions, fleshing out the sound with washes of organ and piano that is here rollicking, there dreamy. Brad Hallen (basses) and Mark Teixeira (drums) consistently prove that they can lay down a perfect rhythm behind any style. At the center of attention, Poxon’s singing is unmannered and effective; his guitar work is creative and assured, with a wide tonal palette; and his songs are genre-perfect exemplars of soul, blues, ballads, and rock, yet have the spark of originality. The stylistic reach is impressive. “College Boy” is pumping, roots rock in prime Chuck Berry style, with a well-constructed, raw guitar lead. “Please Come Home” hints at time spent listening to Ray Charles’s deepest R&B ballads, “All By Myself” channels Dave Bartholomew’s more raucous productions for Fats Domino, and “Without Me” sounds like it has at least a little Spanish Harlem soul in its lineage. “You Lied” is part Don Covay, part Coasters; “Too Bad,” a soul shuffle, boasts a perfect horn chart and an intentionally primitive guitar solo that does just the trick. The slow rocker “Carol Anne” finds common ground between Derek & The Dominos and the Bottle Rockets. Wistful without becoming maudlin, “Tomorrow,” with its luscious, clarion, jazz-inflected solo, makes a sublime closing time ballad. Cool vocals and a stuttering guitar break knock the swinging “Don’t Come Home” clean out of sight. Nor is the blues side of things neglected. In “You Don’t Love Me,” a tough rumba-shuffle, Poxon displays a killer attitude torn from the pages of early-period B.B. King, with a touch of Freddy. “Fooling Around” is a bracingly uptempo 1950s-style Chicago blues that sounds like a tip of the hat to “Who’s Been Cheating Who,” a song by one of Poxon’s favorite artists, Sean Costello. Texeira and Bears, along with a wild guitar solo, star here. The album closes with a splendid jazz instrumental, “Jammin’ At Lakewest,” that has Poxon and Robillard trading choruses bursting with hip melodic and rhythmic ideas. Andy Poxon seems to have found his own voice as part of a continuing tradition. It seems paradoxical, but Tomorrow’s shift toward more classic blues and soul forms has resulted in music of new excitement and originality. To return to a statement I made earlier, Tomorrow is something else! Highly recommended.